This floated across my Facebook feed last month, and it generated two competing feelings in me that I want to suss out with you. I gave myself a little time before writing about this, because it felt so raw at the time. My first and most pronounced reaction — as intended (I must assume) by the meme’s creators — is that it’s Not Okay that people live like this. In a world that is allegedly populated with people of compassion, kindness, and love for neighbors, this image belies the truth of poverty, war, and greed. I do believe it’s important for those of us fortunate enough to live in peace and prosperity to remember that not everyone in the world is so lucky. I believe it’s critical that those of us with the means to do so should help those facing incalculable challenges. I believe perspective is one of the more valuable things we can be given, particularly when we begin to feel overwhelmed by life’s challenges. And I believe images like this one can be a very helpful reminder of that. 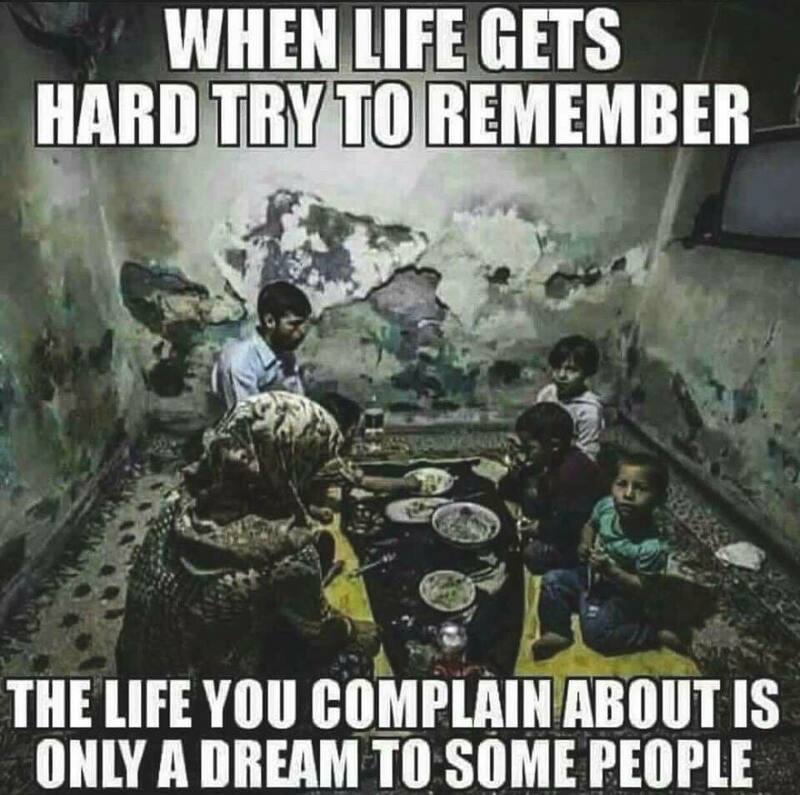 And then, my second reaction kicks in… because the meme here is suggesting that whatever your complaints about life are, they’re basically complaints of a spoiled population. The message seems to be: “Oh, you think you’ve got problems? Let me show you what problems look like!” This invites shame. It begs us to make comparisons that make us feel guilty for our privileges. It robs us of our ability to feel what are legitimate feelings of struggle and uncertainty. The message seems to be: If your life is imperiled, you aren’t allowed to identify problems in your life. I object. Each of us has struggles that nobody else will ever know. We fight back against a culture that tells us we’ll never be enough; some of us get swallowed up by the critical voices in our heads that demean, demoralize, and destroy any sense of confidence or goodness we might manage to muster. No matter our circumstances in life, we are all fighting battles. Some of them are for survival in the most primal sense. Others are for survival in a more existential sense. One kind of battle is not inherently ‘better’ (in a worthy-of-fighting sense) than any other. They just are. I genuinely cherish the perspective I gain when I think about those who live in parts of the world where basic human needs are not readily available. I don’t want to become ignorant of or numb to the very real threats to humanity in our world today. But that doesn’t mean that I dismiss any challenge I face on a given day as insignificant. You are not a bad person for feeling the way you do about your life’s challenges. Regardless of how small or large those challenges are. Incidentally, if you’re looking for a place to share a little of what you have with those who have very little, I wholeheartedly recommend the charity set up by my friend and heroine, Kayra, Art Without Borders. Unlike some very large charity organizations, every dollar you donate to Art Without Borders goes directly to enriching the lives of real humans with real stories. She buys art supplies for refugees to create artwork; she sells that artwork at shows in the US and throughout Europe; the money for the artwork goes directly back to the artists; they use that money to buy food, necessary supplies, and travel to reunite with their families. It’s the very definition of impact. And Kayra does this all between work assignments, using her own financial resources to travel to where the refugees live, waiting resettlement in Europe or elsewhere. Previous ArticleWhat does “too much” mean, really?